Our objective in this column is to look across the five major crops¾corn, cotton, rice, soybeans and wheat¾to see if we can make a composite evaluation of the effect of the Asian Crisis on total Asian crop imports. Over the last few weeks, we have spent considerable time on the Asian Crisis issue because it continues to pervade many analytical discussions and much of the press coverage of agriculture’s current price and income problems. In our previous analyses of the effect of the crisis on U.S. crop exports, we conducted year-by-year examinations of each of the five major U.S. export crops. In those studies, the 1997 and 1998 crop years were our central focus since the Asian Crisis hit in 1997 and it was in full bloom in 1998. This week’s analysis focuses on all of Asia as well as the total of the five crops. Figure 1 shows the composite domestic demand for all Asian nations for corn, cotton, rice, soybeans and wheat in thousand metric tons for the years 1981 through 1999. Asian domestic demand for the five crops increased steadily for the entire 19-year period. The average domestic demand for the 1996-1999 period stood at 802,981 million metric tons (mmt), well above the 1991-1995 period average of 729,897 mmt. Clearly, total Asian domestic crop demand continued to increase throughout the period, albeit at a slightly lower pace than the first five years of the period. Figure 1. A composite of Asian domestic demand for corn, cotton, rice, soybeans and wheat as measured in thousand metric tons. Domestic demand continued to increase throughout the nineteen year period shown, including the years most closely associated with the Asian Crisis, 1997 and 1998. That is not to say that there are not instances of import declines by the Asian countries for some crops during the crisis. However, as our analysis shows, overall it would be extremely difficult to argue that the Asian Crisis was a major cause of the general decline in U.S. crop agriculture’s prices and market incomes. 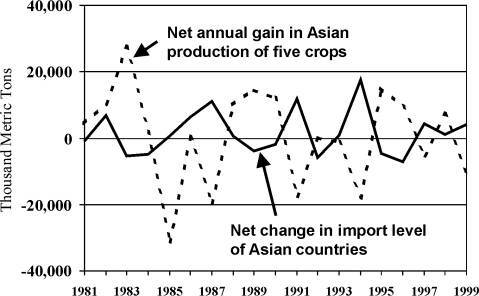 Figure 2 shows that total imports of the five crops by all Asian countries actually increased in the years during and following the crisis. 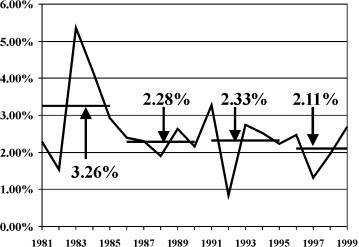 The big drops in Asian crop imports occurred in 1995 and 1996, prior to the Asian Crisis. As we have reported, commodity-by-commodity, in earlier columns, production levels in this country and in export-competing countries have had a major impact on U.S. prices and export levels during the last four years. Figure 2 shows that production levels in importing countries are also extremely important determinants of their import needs¾our export opportunities. Clearly, Asian crop imports are inversely related to the size of the gap between their domestic production and domestic use of the crops. Imports increase when local production declines compared to domestic demand and vice versa. Figure 2. A comparison of the annual change in Asian composite imports of the five crops¾corn, cotton, rice, soybeans and wheat¾with the Asian net annual gain in production over increase in demand. While there is some variability in Asian imports of the five agricultural commodities, the variability is inversely related to net gain in production over consumption. Perhaps, the most surprising finding of this analysis is that the growth in Asian total domestic demand for the five crops was not accelerating during the years in which the 1996 Farm Bill was being debated. Fluctuating maybe, but not accelerating. So, while Asian per capita incomes were growing at very rapid rates in the early 1990s, even approaching double digits in China and other Asian countries, annual average rates of growth in the total Asian domestic demand for the five crops were on a declining path compared to the early 1980s (figure 3). Figure 3. Asian composite growth in domestic demand for the five crops: corn, cotton, rice, soybeans and wheat. The two-tenths of one percent drop in the rate of growth over the four years that include the Asian Crisis is not the dramatic drop that has been asserted. Rather the drop in the rate of growth in crop demand continues a long-term trend running back into the early 1980’s. Contrary to what is generally perceived, there was no “sudden drop” in Asian total domestic crop-demand, period. Even if the full two-tenths of one percent slow-down in the growth in Asian domestic demand for the five crops shown in figure 3 for the 1996 to 1999 period (about 1.6 million metric tons) were attributable to the Asian Crisis, it would still be a gnat when compared to the elephant of total increased crop production in the U.S., our export competing countries, and the Asian countries themselves (32.9 million metric tons or 20 times the full rate of slowdown in Asian demand growth). Enough said. NOTE: All data used in our various analyses of world trade are from the Production, Supply, and Demand (PS&D) database of the Economic Research Service, U.S. Department of Agriculture. You can access a DOS-based interface to the PS&D database at: http://usda.mannlib.cornell.edu/data-sets/international/93002/. If you are interested in a Windows-based interface to PS&D that accesses the same data, makes all the data immediately available on your computer, plots and exports data in American units as well as in thousand metric tons and allows transformations (creation of new variables such as production minus domestic demand), send a request to my e-mail address (dray@utk.edu). A version of the APAC data manager will be made available to you free of charge.